What is Inflammation & Whats It’s True Role In the Body? Inflammation is a vital part of the body’s immune response. It is the body’s attempt to heal itself after an injury; defend itself against foreign invaders, such as viruses and bacteria; and repair damaged tissue. Without inflammation (acute), wounds would fester and infections could become deadly. Inflammation (chronic) can also be very problematic though, and it plays a role in many chronic diseases. Again there are two types of inflammation: acute and chronic (sometimes called systemic) inflammation. Acute inflammation arises after a cut or scrape in the skin, an infected ingrown nail, a sprained ankle, acute bronchitis, a sore throat, tonsillitis or appendicitis. It is short-term and the effects subside after a few days. Chronic inflammation is long-term and occurs in “wear and tear” conditions, including osteoarthritis, and autoimmune diseases, such as lupus and rheumatoid arthritis, allergies, asthma, inflammatory bowel disease and Crohn’s disease, Walker said. Habitual or environmental factors, such as excess weight, poor diet, lack of exercise, stress, smoking, pollution, poor oral health and excessive alcohol consumption can also lead to chronic inflammation. Often, acute inflammation is perceived as “good,” because it is the body’s attempt to heal itself after an injury, and chronic inflammation as “bad” but Walker said that is not a very useful distinction. Whether acute or chronic, inflammation “is the body’s natural response to a problem, so it makes us aware of issues that we might not otherwise acknowledge,” he said. Chronic inflammation, sometimes called persistent, low-grade inflammation, happens when the body sends an inflammatory response to a perceived internal threat that does not require an inflammatory response. The white blood cells swarm, but have nothing to do and nowhere to go, and they sometimes eventually start attacking internal organs or other necessary tissues and cells. Other times, the threat is real but we do not feel it or the inflammatory response, and the inflammation can persist forever. Persistent inflammation has been linked to a variety of ailments, including heart disease. It is often associated with environmental or habitual factors, such as pollution or poor diet, which has made it of interest to nutritionists. 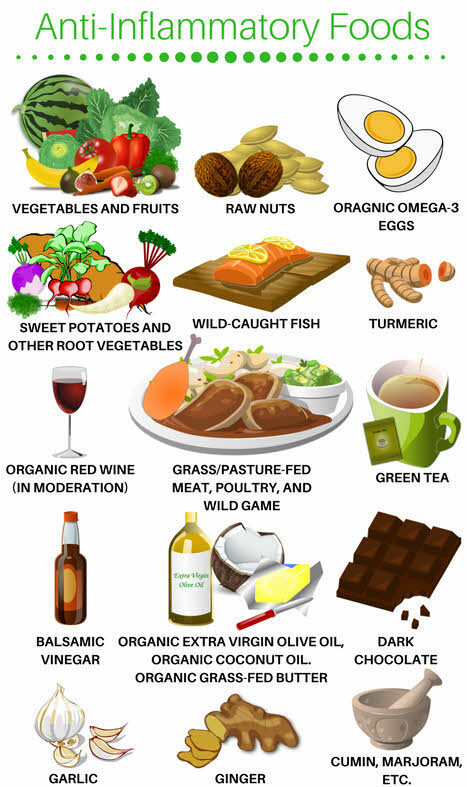 Foods that trigger chronic inflammation. Research shows that a significant contributor to chronic inflammation comes from what we eat, and you’ll soon find that many of the following inflammatory foods have a place in your diet. When you eat them daily, you’ll constantly be turning on your body’s alarm system. Because your immune system alarm is never disarmed, over time, this incessant inflammatory response can lead to weight gain, drowsiness, skin problems, digestive issues, and a host of diseases, from diabetes to obesity to cancer. Common Culprits: Soda, snack bars, candy, baked sweets, coffee drinks. Bet you could’ve guessed this one. According to a review in the Journal of Endocrinology, when we eat too much glucose-containing sugar, the excess glucose our body can’t process quickly enough can increase levels of pro-inflammatory messengers called cytokines. And that’s not all. Sugar also suppresses the effectiveness of our white blood cells’ germ-killing ability, weakening our immune system and making us more susceptible to infectious diseases. A simple swap is subbing out harmful high-glycemic foods (which spike and crash blood sugar) for low GI alternatives, like whole grains and foods with healthy fats, protein, and fibers. A study in the Journal of Nutrition discovered that on an equal calorie diet, overweight participants who ate a low-GI diet reduced levels of the inflammatory biomarker C-reactive protein whereas participants on a high GI diet did not. Sugar isn’t only added to obvious products like candy bars and sodas. Common Culprits: Mayonnaise, salad dressings, barbecue sauce, crackers, bread, potato chips. Once we became aware of the artery-clogging ill effects of trans fats, manufacturers switched to injecting their products with or frying their foods in vegetable oils such as soy, corn, sunflower, safflower, or palm oil—which wasn’t much better. 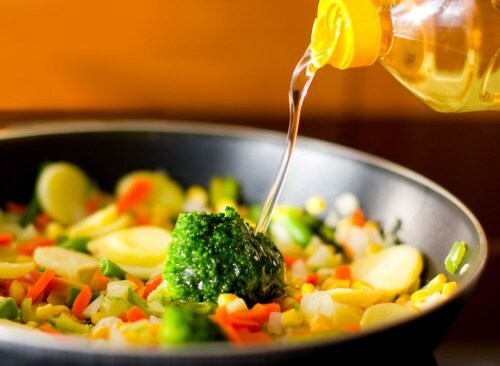 That’s because these vegetable oils have a high concentration of the inflammatory fat, omega-6, and are low in the anti-inflammatory fat, omega-3. In fact, Americans are eating so many vegetable-oil-laden products that the average person has an omega-6 to omega-3 ratio of around 20:1 when it should be 1:1. 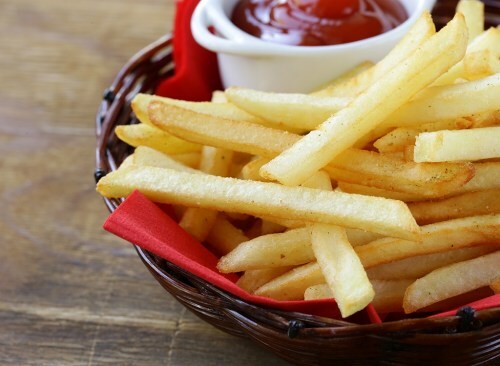 Common Culprits: Fried foods like french fries, fried chicken, fish sticks, chicken tenders, onion rings. 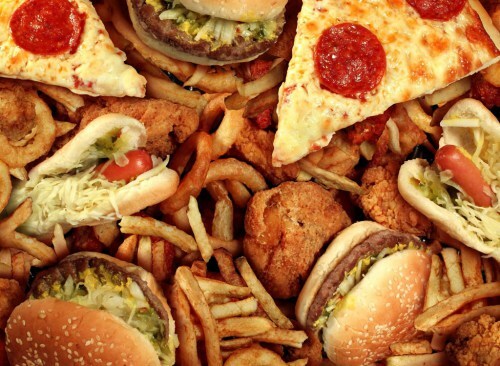 Another issue with these vegetable-oil-fried and processed foods is that they contain high levels of inflammatory advanced glycation end products (AGEs), compounds that form when products are cooked at high temperatures, pasteurized, dried, smoked, fried, or grilled. Researchers from the Mount Sinai School of Medicine found that when people cut out processed and fried foods that have high levels of AGEs, markers of inflammation in their body diminished. 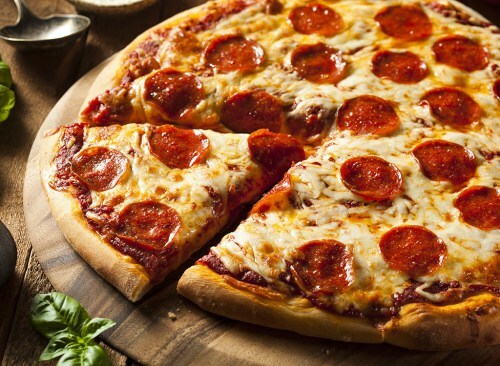 Common Culprits: Pizza, white bread, crackers, pasta, pretzels, flour tortillas, breakfast cereals, bagels. Refined wheat flours have been stripped of their slow-digesting fiber and nutrients, which means your body can break down the foods made from this ingredient very quickly. The more quickly your body digests glucose-containing foods, like these carbs, the faster your blood sugar levels can spike, which also spikes your insulin levels—a compound associated with a pro-inflammatory response. A Journal of Nutrition study found that a diet high in refined grains showed a greater concentration of the inflammatory marker, PAI-1, in the blood. On the other hand, a diet rich in whole grains resulted in a lower concentration of the same marker as well as one of the most well-known inflammatory biomarkers, C-reactive protein (CRP). Common Culprits: Milk, soft cheeses, yogurt, butter. While a moderate intake of yogurt can actually help decrease inflammation with its gut-healing probiotics, dairy is also a source of inflammation-inducing saturated fats. 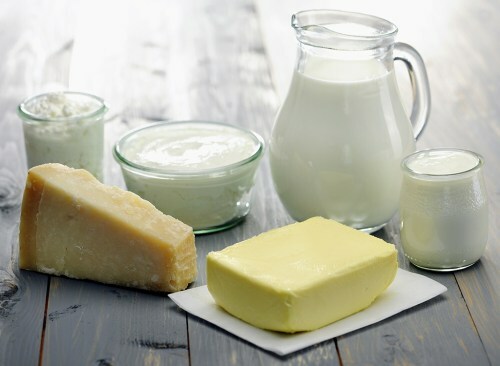 On top of that, studies have connected full-fat dairy with disrupting our gut microbiome, actually decreasing levels of our good gut bacteria which are key players in reducing inflammation. And lastly, dairy is a common allergen, with about 1 in 4 adults having a difficulty in digesting milk, whether it’s lactose intolerance or a sensitivity to its casein proteins. Either way, any type of allergen can trigger inflammatory reactions through the release of histamines. If you feel particularly bloated after a few blocks of cheese, you might consider cutting dairy from your diet. P.S. Don’t worry about not getting enough calcium if you cut out dairy: A 2014 study published in the British Medical Journal found no correlation between fewer bone fractures and dairy consumption. Instead, check out these 20 Calcium-Rich Foods That Aren’t Dairy. Common Culprits: No-sugar-added products, no-calorie “Diet” soft drinks. 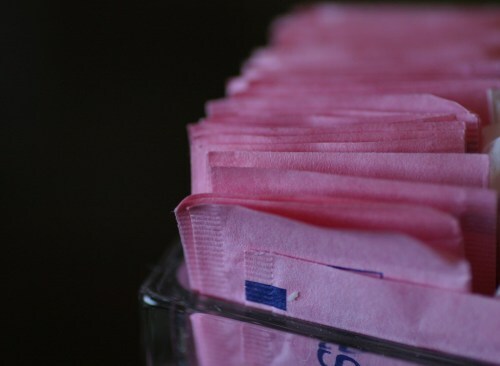 A 2014 study published in Nature found that artificial sweetener consumption in both mice and humans enhances the risk of glucose intolerance by altering our gut microbiome. Researchers also found an increase in bad gut bacteria that have previously been associated with type 2 diabetes. When our bodies can’t metabolize glucose properly, it can lead to a greater release of inflammatory cytokines, as is the case with sugar and refined carbs. On top of that, artificial sweeteners disrupt the composition of our gut microbiota by decreasing levels of the good bacteria Bacteroides, which are known to help release anti-inflammatory compounds. 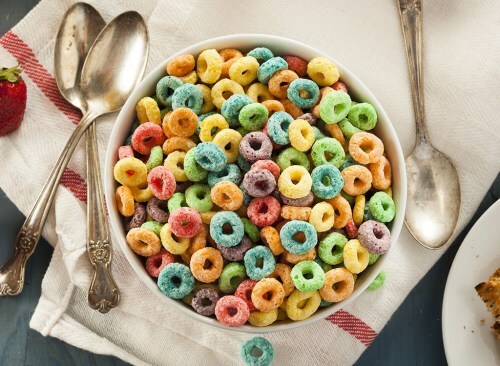 Common Culprits: Breakfast cereals, processed foods containing fruit, candy, ice cream. Artificial means not found naturally in nature. And that means your body usually doesn’t have a way to process it. Ingredients like artificial coloring—which are made from petroleum (oil)—have been implicated in a host of health issues, from disrupting hormone function, to causing hyperactivity in children, to tumor production in animal studies. A meta-analysis in the journal Alternative Therapies in Health and Medicine found that our immune system attempts to defend the body from these synthetic colorants, which activates the inflammatory cascade. Another study by researchers at Georgia State University found that additives like emulsifying agents used to thicken foods can disrupt the bacterial makeup of the gut, leading to inflammation and weight gain in animals. Common Culprits: Burgers, pizza, candy, chips. 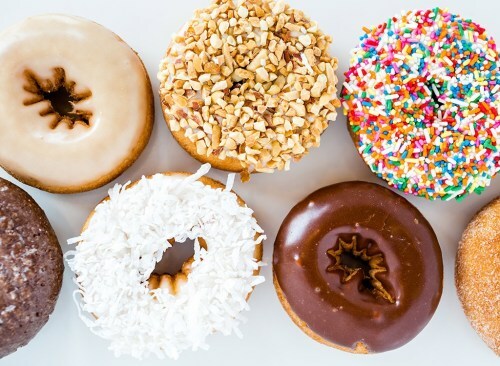 We may have just absolved saturated fats of their connection to heart disease, but that doesn’t mean they’re out of the woods just yet. That’s because multiple studies have connected saturated fats with triggering white adipose tissue (fat tissue) inflammation. This white tissue is the type of fat that stores energy, rather than burns energy like brown fat cells do. And as your fat cells get bigger with greater intakes of saturated fats, they actually release pro-inflammatory agents that promote systemic inflammation, according to a review in the journal Expert Review of Cardiovascular Therapy. Common Culprits: Beef, chicken, pork. Because cattle, chicken, and pigs didn’t evolve on a grain-fed diet, many producers have to load up their animals with antibiotics. These drugs not only keep the animals from getting diseases in cramped feedlots or getting sick from their unnatural diet, but they also help them (and us) gain weight faster. Altogether, this means we’re eating meats that are higher in inflammatory saturated fats, have greater levels of inflammatory omega-6s from the corn and soy diet, and our body thinks it’s in a constant state of attack due to ingesting leftover levels of antibiotics and hormones. Even worse, when we grill meat at high temperatures, it creates inflammatory carcinogens. Besides limiting red meat to under three days a week, make sure you pick up lean cuts of grass-fed beef for your protein. This healthy source provides more healthy saturated and trans fats as well as inflammation-fighting omega-3s. And you can also add a bit of lemon juice to your meats—the acid acts as an antioxidant, protecting you from the harmful carcinogens producing during grilling. Common Culprits: Bacon, hot dogs, bologna, sausage, jerky. Processed meats are the worst of both worlds. 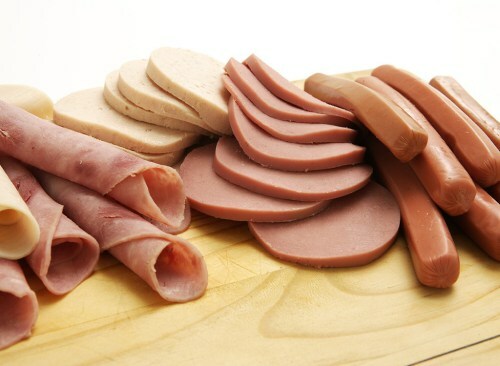 They’re typically made from red meats high in saturated fats, and they contain high levels of advanced glycation end products (AGEs), inflammatory compounds that are created when these processed meats are dried, smoked, pasteurized, and cooked at high temperatures. Not to mention the fact that these sometimes “mystery meats” are injected with a slurry of preservatives, colorings, and artificial flavorings that also register as foreign attackers to our immune system. 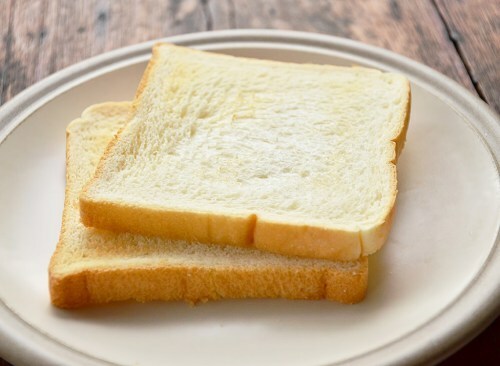 Common Culprits: Store-bought bread made from refined, white flour. Many of the breads on the market can go from flour and yeast to baked bread in just a few hours. But this shortening of the period of fermentation causes a decrease in the amount of starch and gluten the yeast typically can pre-digest for us. Without the assistance in digestion, it can be harder for our bodies to digest the bread’s gluten, causing inflammation in the lining of your intestines. Experts believe this could be one reason for the rise in gluten sensitivity among Americans. Another theory is that modern strains of wheat contain a super starch known as amylopectin A, which has been shown to have inflammatory effects. Either way, store-bought breads should be a pass if you’ve been struggling to lose weight. We are, however, giving bakery-made sourdough the green light; Sourdough bread is one of the surprising fermented foods that provides healthy probiotics to help heal your gut—key in helping to reduce inflammation! 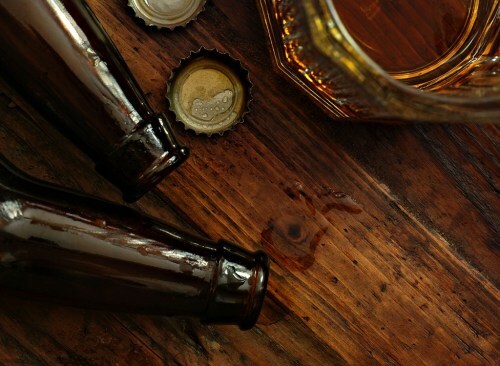 Common Culprits: Beer, sugary alcoholic drinks and most liquors. While some research has shown a drink a day can actually lower levels of the inflammatory biomarker C-reactive protein (CRP), too much alcohol actually has the opposite effect. That’s because the process of breaking down alcohol generates toxic by-products which can damage liver cells, promote inflammation, and weaken the body’s immune system. On the other hand, the flavonoids and antioxidants found in wine—as well as the probiotics in beer—might actually contribute an anti-inflammatory effect, according to a study published in the journal Toxicology. Common Culprits: Margarine/shortening; baked goods like doughnuts, cookies, and muffins; non-dairy coffee creamers; frozen pizza; frosting. Because manmade partially hydrogenated oils, also known as trans fats, do not occur naturally in foods, our body doesn’t possess an adequate mechanism to break them down. When our body senses an unknown, foreign object, it can stimulate an inflammatory response. According to the Mayo Clinic, these trans fats can cause inflammation by damaging the cells in the lining of blood vessels. A study in the American Journal of Clinical Nutrition found that women who ate foods high in trans fat also had higher levels of markers of systemic inflammation, like interleukin 6 (IL-6) and C-reactive protein (CRP). 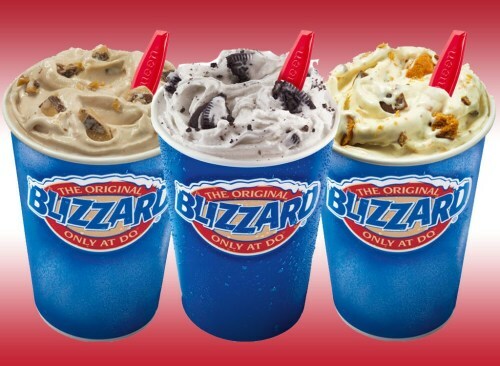 Because the FDA’s guidelines allow products with less than 0.5 grams of trans fats to claim 0 trans fats, be sure to read labels and look out for products with partially hydrogenated oils—like almost all of Dairy Queen’s blizzards. Even if you don’t know how to pronounce it, you should know what phthalates (thāl-ates) are. That’s because many of us are unknowingly eating this class of endocrine-disrupting chemical toxins. Similar to BPA, phthalates are used in plastic food and beverage packaging—and they’re not staying there. 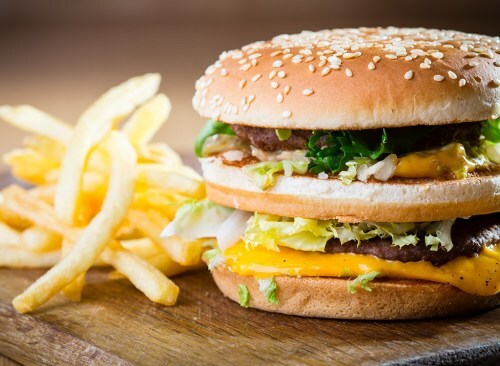 Just this year, a study made headlines for its finding that people who often ate fast food had dose-dependent higher levels of phthalate metabolites than infrequent eaters. Bad news for all-day-breakfast lovers since a separate study published in Environmental Science & Technology found phthalates to be associated with the CRP marker of inflammation. 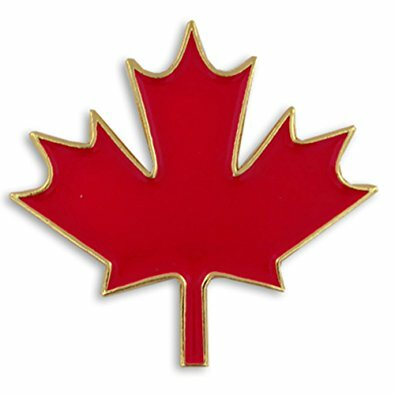 Another study in Environmental Health connected higher exposure to phthalates with metabolic syndrome, a disease also commonly associated with increased levels of inflammation. Many popular diets already follow anti-inflammatory principles. For example, the Mediterranean diet contains fish, whole grains, and fats that are good for the heart. Research has shown that this diet can reduce the effects of inflammation for people in pain or with cardio vascular disease, or diabetes. 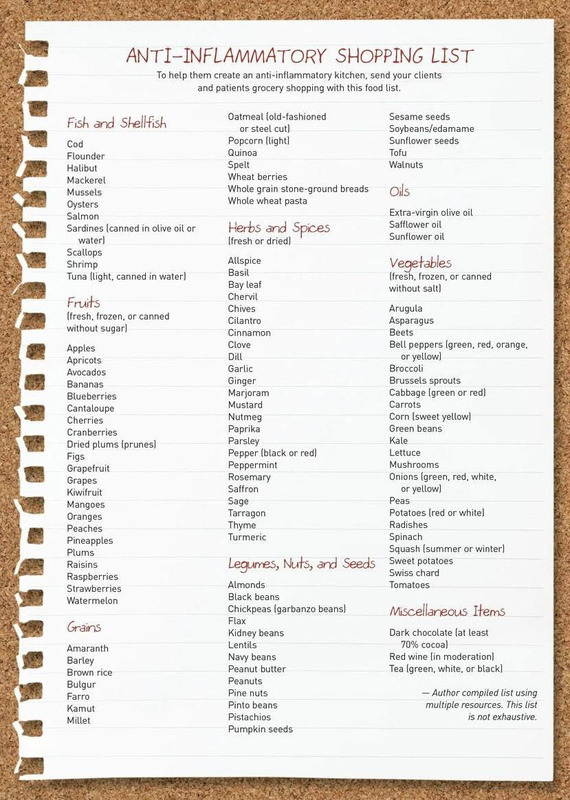 This is a very basic list of the types of foods that do not tend to promote inflammatory responses in the body. This is a more comprehensive list of the proven foods that help the body manage inflammation, lose weight and help control diabetes. The Non-food causes of chronic inflammation. Psychological stress in the form of a panic attack, rapid pulse, or night sweats is a sign of cortisol-prompted inflammation. Cortisol is your “fight or flight” hormone, the one that kicks from the adrenal glands when a threat is perceived. It results in dilated blood vessels that force blood to your organs in preparation of an attack. This “fight or flight” response becomes a normal state during times of persistent stress, and chronic inflammation occurs when your immune system and adrenals are on over-drive. The body reacts in a similar manner when stress is physical. Take a hypoglycemic (low blood sugar) attack for example. This physical panic in the body will trigger an immune response and chronic inflammation may cause your intestinal tract to go off balance, your skin to break out in hives, and your body to literally shut down. Once you restore nutrients, electrolytes, and sustenance to the body, things will return to normal. However, if you make a habit of skipping meals, your immune system will remain unbalanced. Because chronic inflammation originates in the digestive system, it makes sense that digestive turmoil may actually be a source of inflammation itself. Oftentimes, a simple anti-inflammation diet—one high in essential fatty acids, probiotic digestive supplements, and daily exercise will help balance the intestinal tract and get it working again optimally. When we eat a meal that’s particularly rich, our digestive systems need to put in extra work in order for efficient digestion. This most often occurs if we rely on sugary, or processed, or fast food as the main staples of our diets. When the metabolism and GI tract are overworked; chronic inflammation often results. The medical community has also linked insulin and glucose levels to chronic inflammation. For instance, obese individuals who are prone to developing type 2 diabetes often have issues with chronic inflammation. Specific food allergy triggers—such as casein (found in dairy) and gluten (found in wheat) will cause an inflammatory response in the digestive tract for sensitive individuals. Inflammation has also been linked to unbalanced levels of certain hormones, such as estrogen, progesterone, and testosterone. That’s why chronic inflammation often inflicts menopausal women, causing conditions like osteoporosis, weight gain, and adult acne. Certain individuals may experience an inflammatory response to particular synthetic fibers found in products like latex, adhesives, and plastics. Often times these synthetic triggers exist in our workplaces or homes and cause turmoil in our bodies without us even knowing. Chemical cleaning products, cosmetics, or air fresheners are another common source of inflammation—particularly if chemicals are airborne or irritants that are absorbed directly by the skin. Even low chemical exposure can exist at home, at work, in the air we breathe and the water we drink prompting chronic inflammation. The bottom line is you do have control over chronic inflammation by being aware of the food and non-food triggers of chronic, low-grade inflammation. If there is anything that you can do to impact your health, managing chronic inflammation is should be one of the key areas of concern. Organic Sulfur is a key chronic inflammation support that helps the body manage and activate chronic inflammation response at a cellular level.